This is Book 12 of the Analects of Confucius. 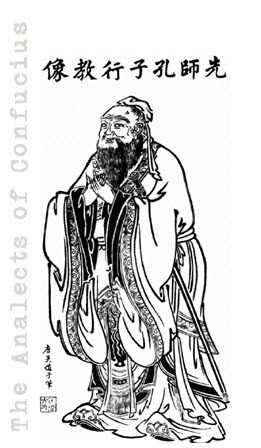 Find the complete text of the Analects of Confucius. Yen Yuen was asking about man's proper regard for his fellow-man. The Master said to him, "Self-control, and a habit of falling back upon propriety, virtually effect it. Let these conditions be fulfilled for one day, and every one round will betake himself to the duty. Is it to begin in one's self, or think you, indeed! it is to begin in others?" "I wanted you to be good enough," said Yen Yuen, "to give me a brief synopsis of it." Then said the Master, "Without Propriety use not your eyes; without it use not your ears, nor your tongue, nor a limb of your body." "I may be lacking in diligence," said Yen Yuen, "but with your favor I will endeavor to carry out this advice." Chung-kung asked about man's proper regard for his fellows. To him the Master replied thus: "When you go forth from your door, be as if you were meeting some guest of importance. When you are making use of the common people (for State purposes), be as if you were taking part in a great religious function. Do not set before others what you do not desire yourself. Let there be no resentful feelings against you when you are away in the country, and none when at home." "I may lack diligence," said Chung-kung, "but with your favor I will endeavor to carry out this advice." Sz-ma Niu asked the like question. The answer he received was this: "The words of the man who has a proper regard for his fellows are uttered with difficulty." "'His words�uttered with difficulty?'" he echoed, in surprise. "Is that what is meant by proper regard for one's fellow-creatures?" "Where there is difficulty in doing," the Master replied, "will there not be some difficulty in utterance?" The same disciple put a question about the "superior man." "Superior men," he replied, "are free from trouble and apprehension." "'Free from trouble and apprehension!'" said he. "Does that make them 'superior men'?" The Master added, "Where there is found, upon introspection, to be no chronic disease, how shall there be any trouble? how shall there be any apprehension?" The same disciple, being in trouble, remarked, "I am alone in having no brother, while all else have theirs�younger or elder." Tsz-chang asked what sort of man might be termed "enlightened." The Master replied, "That man with whom drenching slander and cutting calumny gain no currency may well be called enlightened. Ay, he with whom such things make no way may well be called enlightened in the extreme." Tsz-kung put a question relative to government. In reply the Master mentioned three essentials:�sufficient food, sufficient armament, and the people's confidence. "But," said the disciple, "if you cannot really have all three, and one has to be given up, which would you give up first?" "And if you are obliged to give up one of the remaining two, which would it be?" "The food," said he. "Death has been the portion of all men from of old. Without the people's trust nothing can stand." Kih Tsz-shing once said, "Give me the inborn qualities of a gentleman, and I want no more. How are such to come from book-learning?" Tsz-kung exclaimed, "Ah! sir, I regret to hear such words from you. A gentleman!�But 'a team of four can ne'er o'er-take the tongue!' Literary accomplishments are much the same as inborn qualities, and inborn qualities as literary accomplishments. A tiger's or leopard's skin without the hair might be a dog's or sheep's when so made bare." Duke Ngai was consulting Yu Joh. Said he, "It is a year of dearth, and there is an insufficiency for Ways and Means�what am I to do?" "Why not apply the Tithing Statute?" said the minister. "But two tithings would not be enough for my purposes," said the duke; "what would be the good of applying the Statute?" The minister replied, "So long as the people have enough left for themselves, who of them will allow their prince to be without enough? But�when the people have not enough, who will allow their prince all that he wants?" 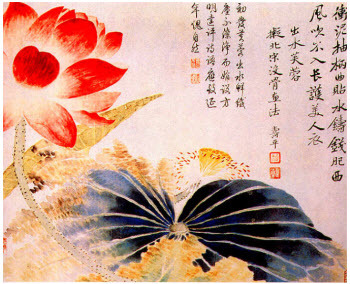 Tsz-chang was asking how the standard of virtue was to be raised, and how to discern what was illusory or misleading. The Master's answer was, "Give a foremost place to honesty and faithfulness, and tread the path of righteousness, and you will raise the standard of virtue. As to discerning what is illusory, here is an example of an illusion:�Whom you love you wish to live; whom you hate you wish to die. To have wished the same person to live and also to be dead�there is an illusion for you." Duke King of Ts'i consulted Confucius about government. His answer was, "Let a prince be a prince, and ministers be ministers; let fathers be fathers, and sons be sons." "Good!" exclaimed the duke; "truly if a prince fail to be a prince, and ministers to be ministers, and if fathers be not fathers, and sons not sons, then, even though I may have my allowance of grain, should I ever be able to relish it?" Tsz-lu never let a night pass between promise and performance. "In hearing causes, I am like other men," said the Master. "The great point is�to prevent litigation." Tsz-chang having raised some question about government, the Master said to him, "In the settlement of its principles be unwearied; in its administration�see to that loyally." Rules of Propriety, is not likely to transgress." Again, "The noble-minded man makes the most of others' good qualities, not the worst of their bad ones. Men of small mind do the reverse of this." Ki K'ang was consulting him about the direction of public affairs. Confucius answered him, "A director should be himself correct. If you, sir, as a leader show correctness, who will dare not to be correct?" Ki K'ang, being much troubled on account of robbers abroad, consulted Confucius on the matter. He received this reply: "If you, sir, were not covetous, neither would they steal, even were you to bribe them to do so." Ki K'ang, when consulting Confucius about the government, said, "Suppose I were to put to death the disorderly for the better encouragement of the orderly�what say you to that?" "Sir," replied Confucius, "in the administration of government why resort to capital punishment? Covet what is good, and the people will be good. The virtue of the noble-minded man is as the wind, and that of inferior men as grass; the grass must bend, when the wind blows upon it." Tsz-chang asked how otherwise he would describe the learned official who might be termed influential. "I mean," replied the disciple, "one who is sure to have a reputation throughout the country, as well as at home." "That," said the Master, "is reputation, not influence. The influential man, then, if he be one who is genuinely straightforward and loves what is just and right, a discriminator of men's words, and an observer of their looks, and in honor careful to prefer others to himself�will certainly have influence, both throughout the country and at home. The man of mere reputation, on the other hand, who speciously affects philanthropy, though in his way of procedure he acts contrary to it, while yet quite evidently engrossed with that virtue�will certainly have reputation, both in the country and at home." Fan Ch'i, strolling with him over the ground below the place of the rain-dance, said to him, "I venture to ask how to raise the standard of virtue, how to reform dissolute habits, and how to discern what is illusory?" "Ah! a good question indeed!" he exclaimed. "Well, is not putting duty first, and success second, a way of raising the standard of virtue? And is not attacking the evil in one's self, and not the evil which is in others, a way of reforming dissolute habits? And as to illusions, is not one morning's fit of anger, causing a man to forget himself, and even involving in the consequences those who are near and dear to him�is not that an illusion?" The same disciple asked him what was meant by "a right regard for one's fellow-creatures." He replied, "It is love to man." Asked by him again what was meant by wisdom, he replied, "It is knowledge of man." Fan Ch'i did not quite grasp his meaning. The Master went on to say, "Lift up the straight, set aside the crooked, so can you make the crooked straight." Fan Ch'i left him, and meeting with Tsz-hi� he said, "I had an interview just now with the Master, and I asked him what wisdom was. In his answer he said, 'Lift up the straight, set aside the crooked, and so can you make the crooked straight.' What was his meaning?" "Ah! words rich in meaning, those," said the other. "When Shun was emperor, and was selecting his men from among the multitude, he 'lifted up' K�u-y�u; and men devoid of right feelings towards their kind went far away. And when T'ang was emperor, and chose out his men from the crowd, he 'lifted up' I-yin�with the same result." Tsz-kung was consulting him about a friend. "Speak to him frankly, and respectfully," said the Master, "and gently lead him on. If you do not succeed, then stop; do not submit yourself to indignity." The learned Tsang observed, "In the society of books the 'superior man' collects his friends; in the society of his friends he is furthering good-will among men."